It’s a week before my mother’s birthday and once again, I have no idea what to give her. First thought, Amazon gift card! But, is a gift card, even one from amazon with those billions of books to choose from, tacky to give your very own mother? Second thought, something to do with socks. Until recently, she only knit socks. Yes, this is one of those rare cases where I taught Mom (from a distance for the most part) how to knit because she saw me wandering around my apartment with my red and green homemade socks at Chirstmas time. She decided, I want socks. Etsy is a great site to visit if you are out of ideas and need a gift. These are handmade or vintage items that have a unique flair to them. They don’t scream ‘I ran into Walmart at the last minute and got you this lint-remover.’ It’s a great website to just browse around as long as you haven’t had three glasses of wine and a paypal account linked to your credit card. Then it is a bad, bad, bad site. Go to the Etsy Showcase and browse around. I found the flowers for my hairdo on my wedding day off there and they were absolutely perfect. 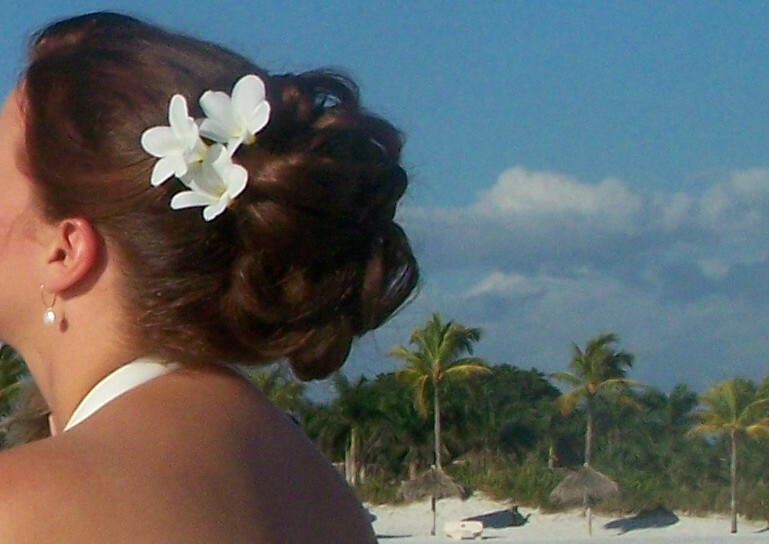 The picture is of the three plumeria hairpins created by Butterfly Enchantress on Etsy. I’ve also bought beautiful unique earrings from Lowcountry Beadworks. They have everything from jewelry, to fabric, to toys, to pet collars. Take a look and don’t blame me if you charge up that visa bill.